Many thanks to Michael for a fab evening - with very positive comments from the 39 people that attended! We had a great time too - hope you eventually got the brittle toffee out of your teeth! Would heartily recommend Michael's talks to anyone out there. Lots of fun, informal and very informative! comment by Rachel Gallehawk, Thurrock Libraries. Michael Jecks is available for events at certain times of the year, depending upon his workloads. 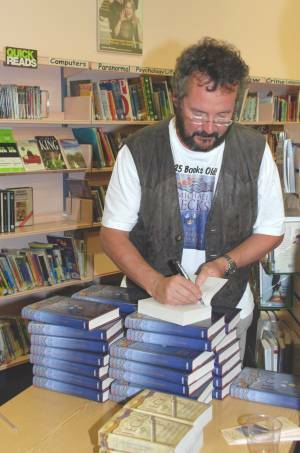 He is a regular speaker at literary events, talking about writers and writing, about his own career, as well as covering historical facts and some of the fallacies which have coloured modern views of medieval life. Michael is a popular panelist at literary festivals, and is an experienced moderator himself. He is a professional after-dinner speaker, and has a wealth of anecdotes about writing and researching. Alone or with Medieval Murderers, which he founded, Michael also runs successful creative writing workshops for large groups. So, whether it is for a small reading group, or for a large company, Michael will probably be able to help with his own brand of motivational or purely humorous talks.